Angela’s Note: I would make one batch filled or with a mix-in, then another batch plain or with cinnamon sugar topping. I made some (with the same amount of batter per muffin) in a canoe pan which the kids thought were fun and very easy to dip. Makes about 17 of plain or filled muffins. If adding mix-ins, expect more depending on type of mix-in added. 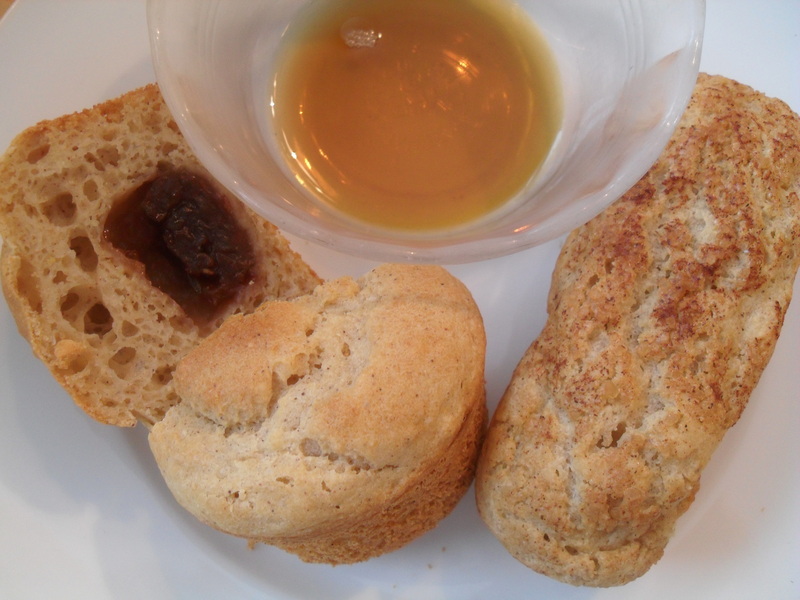 Optional for filled muffins: 17 teaspoons jam, fruit compote or filling of choice. Optional if cinnamon sugar topped: 1 Tablespoon sugar or cane juice crystals and 1 teaspoon ground cinnamon blended. Optional if want things mixed into your muffins: Check this post for mix-in options. Use the amounts specified. Preheat oven to 375 degrees. Oil the cups of a muffin tin well. Set aside. Whisk the dry ingredients together in a bowl. Mix the wet ingredients together until blended then add to the dry ingredients. Stir until well blended together (use the whisk attachment of my mixer or an immersion blender). There may still be some small lumps, but try not to have too many. Set 3/4 cup of batter aside. If making filled muffins: In oiled muffin tin, place 1/4 cup batter. Top with 1 level teaspoon for desired filling. Lightly press filling into bater until level with batter. Cover filling with 1 Tablespoon of reserved batter. Leave plain or sprinkle with a bit of cinnamon sugar. If making plain muffins: You do not to set aside 3/4 cup of batter. In an oiled muffin tin place a scant 1/3 cup of bater. Leve plain or sprinkle with cinnamon sugar. If adding mix-ins: After batter is blended add mix-ins of choice. You do not need to set aside 3/4 cup batter. Place a scant 1/3 cup batter in each oiled muffin tin. Sprinkle with cinnamon sugar or chopped nuts as desired. Bake at 375 degrees for 20-25 minutes until golden and cooked through. Allow to cool in pan for a couple of minutes, then remove. Serve with your favorite pancake topping if desired and enjoy! To freeze: Allow to cool completely. Place in a freezer ziplock, remove as much air as possible, label and freeze. To serve: Thaw and heat trough. Serve with favorite pancake toppings. To serve: Thaw. Reheat on stove, in microwave or in slow cooker. Place all ingredients (except green beans) in the slow cooker. Cook on low 6 -7 hours. Add green beans for last hour or so to heat. To freeze: Allow to cool, place in containers leaving at least 1/2 headspace at top of container. Freeze. To serve: Reheat with slow cooker or stove until heated through. For the Beef Empanadas make one batch of the Double Batch Gluten Free Pie Crust. You will need to make 4 pie crust recipes. I would probably make the sloppy joes I usually make in the slow cooker, but multiply it 4 to 6 times, or the turkey sloppy joes and multiply that 2-3 times. Brown ground beef in a large skillet. Saute onion and combine all ingredients including cooked ground beef. Add remaining ingredients. Simmer about 20 minutes. Allow to cool. Package in 4 gallon freezer bags. Freeze. This entry was posted in Beef & Bison, Breads, Dairy Free, For the Freezer, Freezer Food Friday, GFCF, Gluten Free, Grains & Legumes. Bookmark the permalink. Very nnice! Thanks for sharing and promoting FFF. I am going to send your blog to a friend who doesn’t do dairy.